They added that the soldiers demolished a home, owned by members of Abu Swai family, rendering them homeless. 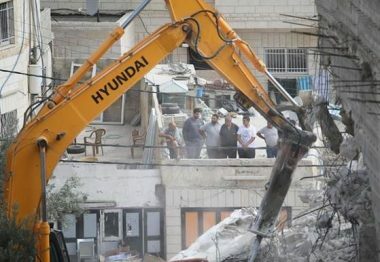 On Monday at dawn, the soldiers demolished four homes, and injured sixteen Palestinians, in the al-Walaja village, west of Bethlehem, in the occupied West Bank. On Wednesday at dawn, the soldiers invaded Kufur Qaddoum town, east of the northern West Bank city of Qalqilia, stormed and searched homes, and fired many gas bombs at Palestinian protesters, causing many to suffer the effects of teargas inhalation. Also at dawn, the soldiers abducted a Palestinian father and his son, in Anabta town, east of Tulkarem, in northern West Bank.